It didn't sound too bad, at first. Milgov wanted to re-establish what the orders called a "presence" on Manhatten. "Deal with criminal elements" they said, "Register salvage operations...taxes in kind...organize a census..."-that all sounded peaceful enough. We were just supposed to go in, scout out the land, find a base of operations, and generally get things ready for Uncle Sugar to come back to the Big Apple big time. Piece of cake...right? 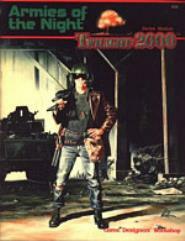 Armies of the Night is a game module for use with Twilight: 2000, GDW's World War III role-playing game. Armies of the Night puts the players' group into the middle of New York City two years after the nukes fell, with the mission of restoring it to government control. There are a few problems, of course...such as the fact that the city doesn't want to be controlled...and theirs is the ninth group to be given this same mission.